Wireless communications provides CNC machines freedom from the tether that traditional cables impose. As such, it provides mobility—a necessity of modern manufacturing. Traditional wiring involves routing cable—usually overhead— in a manner to avoid cranes, power transformers, and any other electrical equipment that generates EMF noise. It is an expensive and time consuming process. Wireless connections have no such pitfalls. The devices are typically mounted securely on or within the CNC cabinet where they can remain protected from outside contaminates and hazards. Electrical and magnetic noise interference is also eliminated thereby allowing higher baud rates for faster program transfers. Another huge benefit is the increased level of protection from lightening disasters. Cables are by nature a conduit for lightening. CNC Innovations knows shop communications. Nearly every software product developed by CNC has used some form of communications link on the shop floor. Years of experience have also defined what constitutes effective and reliable information transfer. With that backdrop we tested wireless DNC devices that first and foremost are easy to install and provide the same unique benefits that our traditional wired systems offer. To that end we recommend devices designed and targeted for shop communications. We then fine-tuned our DNC engine for maximum packet transfers with limited latency. Our work with manufacturers has allowed us to provide devices capable of interrupt driven I/O while maintaining the performance of traditional wired networks. 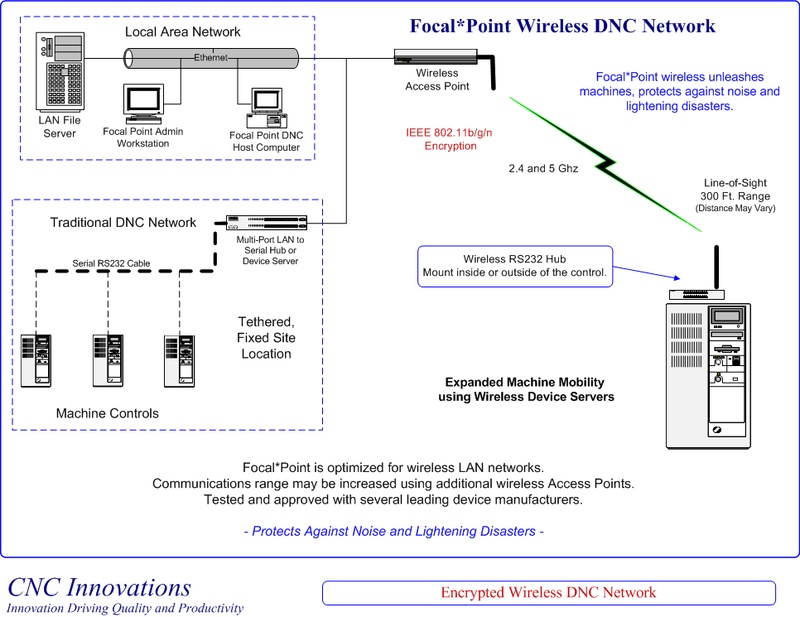 Additionally, given that single-port COMM devices typically utilize AC power from the host CNC, we enhanced our software to recognize when machines are powered-up and activate the wireless device. This offers the benefit of hands free operation when initializing COMM links between remote DNC PCs and the CNC machine. Finally, our recommended devices all provide securely encrypted data transfer, which can be configured on a standalone, non-routable network with additional MAC filtering.